I love Bruce Campbell in movies and on TV, but I think I’m so used to seeing him play light roles that when he’s called upon to be completely serious, it’s a tiny bit jarring (luckily, this happens very rarely). He’s got the looks and the talent to be a leading man in stuff like this, I just think he’s too odd – in a nice way – to stick with straight thrillers for long. Our first shot is of the World Trade Centre, which is always sad to see on film, then straight into the killing! A barmaid leaving her late shift gets hers first – she’s attacked by a couple of Puerto Rican robbers, then when she runs into the park (rather than, I don’t know, back to the bar she just left) and attempts to get help from a cop stood in the shadows, she gets choked to death and her neck snapped for good measure. That this disgusts even the two criminals is a nice touch. The first time you get a glimpse of the Maniac Cop’s profile, any fan of trashy cinema will go “okay, that’s Robert Z’Dar. Why are you hiding him?” but I guess they do sort of explain it later. He kills a random fella driving round, too, and this eventually gets the police to thinking it’s a guy pretending to be a cop, with the lead detective the sole dissenting voice that it might actually be a cop. 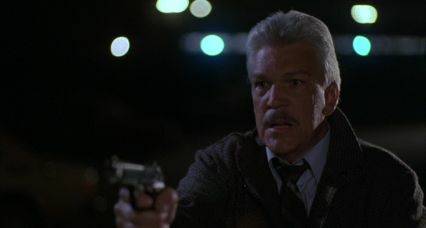 That lead detective is Frank McCrae (Tom Atkins), and he’s got red herrings, sorry co-workers, in the shape of Captain Ripley (William Smith) and Commissioner Pike (Richard Roundtree). The B-movie superstardom is strong in this movie! When they’ve finished setting things up, only then do we get to meet Bruce as Officer Jack Forrest, a man trapped in a loveless marriage who’s having an affair with his co-worker, Detective Therese Mallory (Laurene Landon, whose parents obviously wanted a son called Laurence and had already filled in half the birth certificate). His wife discovers them in a motel – when presumably Mallory has her own place they could go to – and it’s here when things get a bit odd. The wife is abducted from right outside, killed viciously and then dumped back in that same motel room when the lovebirds have left, pinning the murder – and by extension, all the others – on Forrest! There’s twists and gory kills and extremely helpful side characters who fill the main characters in on the plot, but I don’t just want to recap it all. It’s a curiously structured movie, for sure, but at least it’s different, and different is worth celebrating. 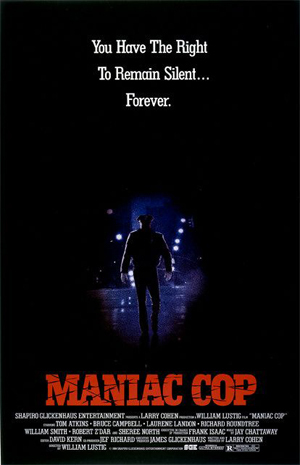 When you finally see the Maniac Cop, front and centre, you’ll think “how on earth did he just walk into that police station?” but boy oh boy, does he love killing and doesn’t mind who. They also give us a flavour of what New York would be like if it was leaked to the press that someone was dressed as a cop killing people – one timid-looking woman ventilates an innocent patrolman’s head, for one – and the TV is full of black people telling their tales of all cops being maniacs when it comes to their community. When our heroes eventually figure out who it is, we also get his backstory dropped into the action, which is both sad and horrifying. When you think about it, it’s pretty much a slasher movie crossed with a police thriller, even if I wish they’d been a tiny bit more explicit about why he’s indestructible – he takes dozens of bullets to the chest and a few to the head, none of which faze him. But it’s got some great set-pieces, including the assault on the police station (definitely not inspired by The Terminator, how dare you?) and the definite feeling that the people who made it put some serious thought into it – the villain’s motivations were once vaguely sympathetic, and the TV news mentions how low crime is with him on the streets, a nice touch. I also admire how they never really tried to make Bruce Campbell a suspect, despite the slight chin-based similarity between him and Z’Dar, and that the nominal hero of the movie is a guy cheating on his wife who doesn’t really do much of anything at the climax. It’s stupid in places, but the energy and strange turns the plot takes (plus grimy real New York locations) make up for that. That’s due, I think, to the B-movie talent behind the camera as well as in front of it. The director is William Lustig, who also gave us “Maniac”; and writer Larry Cohen, who among many movies wrote “It’s Alive!” Oddest of all – this movie’s excellent stunts were brought to us by Spiro Razatos, who’d go on to do the stunts for the last three Fast & Furious movies! Thoroughly enjoyable shlock fun. Give it a go. 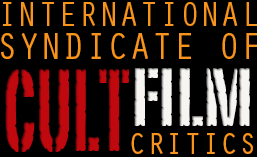 This entry was posted in Reviews and tagged Bruce Campbell, police slasher, Robert Z'Dar, Tom Atkins, World Trade Centre. Bookmark the permalink.